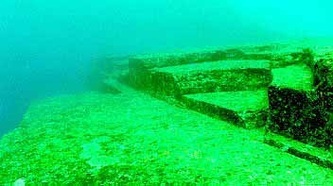 Underwater City PRE 10,000 BC ... Secrets of the Ancients. The seabed contains what appear to be ruins of a previous glacial age and traces of terrestrial flora, fauna and stalactites that form only on the surface. These suggest that these ruins might be more than 3,000 to 10,000 years old, which would make them the world's oldest. 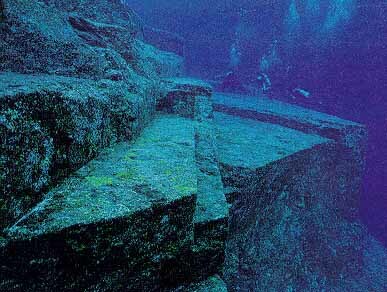 The fame of Yonaguni island began in 1995, when a Japanese marine explorer, Kihachirou Aratake, by chance discovered a set of very singular architectonic structures allegedly belonging to an ancient civilization and previously unknown in archaeology and history. Shortly thereafter, a group of scientists directed by Misaki Kimura, of the University of the Ryukyus, confirmed the existence of the vestiges. They appear, at least superficially, to be comparable to the pyramids of Egypt, Mesopotamia, Mexico, and Peru. 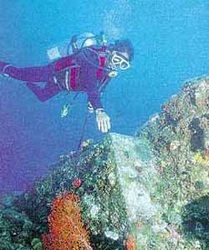 On May 4, 1998, a part of the island was destroyed by a submarine earthquake.Several analyses indicated that a certain structure, which measured 120 m in length, 40 m wide and 20 - 25 m high, was 8000 years old. This would make it much older than the first constructions of Mesopotamia, Egypt, India and China. This antiquity has created discord and controversy among historians and archaeologists since it goes against the accepted chonological history of humanity. Several noted archaeologists, including John Anthony West and Robert Schoch argue that under inspection, the "ruins" turn out to be largely explicable by ocean erosion and coral reef settlements. Most geologists familiar with the area also maintain that the structures are mere geologic processes of natural origin and consistent with other known geological formations. 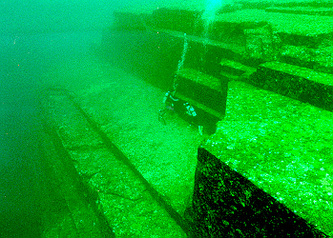 They point to the fact that local rocks above the surface have right angle cleavages, and that aquatic flora and fauna have simply smoothed out much of the surface of the rocks. Furthermore, no tools have been found at the site, which could positively identify human settlement. However, the viability of these theories is undermined when one considers that there are no piles of rocks at the foot of the structures, as would be expected if the near-perfect right angles that define these structures were formed by cleavage of the rocks that make them up. 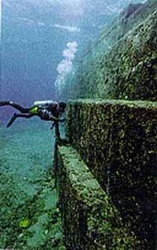 At the time that it was supposedly constructed, the affected area of Yonaguni composed a land bridge between the islands of Taiwan, Ryukyu, and Japan with Asia in the days of the ice age. The level of the sea was lower than at present because of the ice accumulated in the temperate zones. Geologist Teruaki Oshii suggests they have been constructed before the end of the glacial era.